1. Reformed Ethical Wheel. “Collectivism – Individualism” was changed to “Authoritarian – Libertarian” + two new Ethical scales added: Economical values (Socialism – Capitalism) and Environmental awareness (Ecological – Industrial). The total number of available Ethic Points now is 4. Also, some changes to the existing Ethics were made. 2. 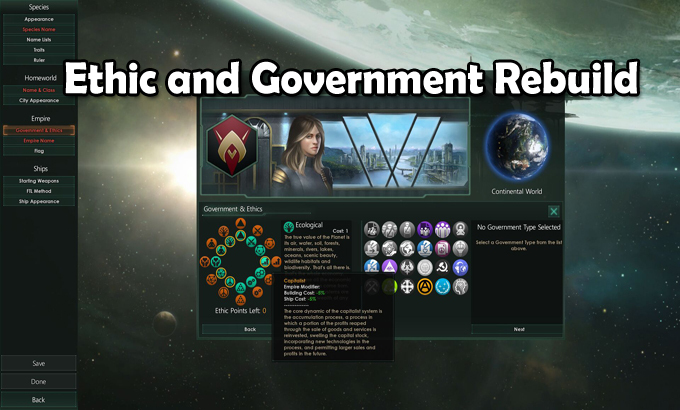 Nine new Government types + some balancing changes to all existing Governments. 3. New technologies, buildings, edicts, AI Personality (“Utopia Builders”) + appropriate changes to the existing one’s.